Let me paint memories for you ... as the are happening ... your dream becomes an original oil painting which will always keep your Special Day alive and be treasured for generations to come. When you book we will discuss painting opportunities, where/how to get the best view of what you would like me to to paint, and the elements and people you would like to have in your painting. On the Day I and arrive 3-4 hours before your reception to scope out my location, set up, and start painting the surroundings ... so that when you arrive, you will be stepping into your painting. 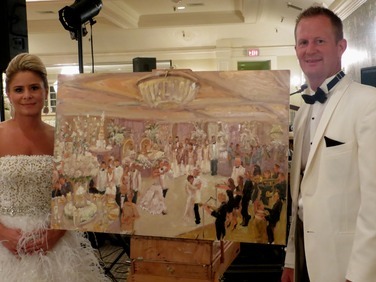 If your wedding has already taken place, or if I am unavailable to paint on your wedding day, I can work fom your photographs afterwards to create a unique and treasured heirloom for you, putting your favorite most important people and details into the same picture. 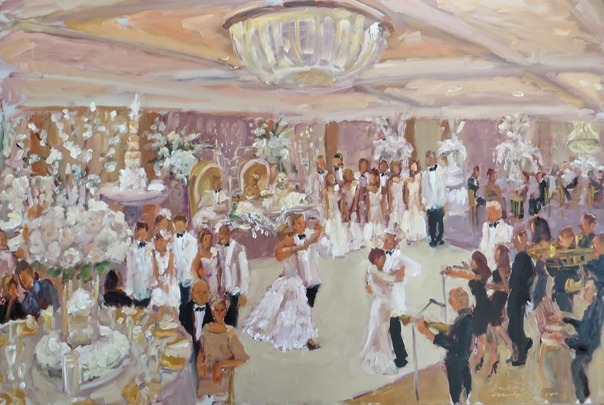 Yourr wedding painting can be 18x24, 20x24, 24x30, 24x36, 30x40 or even bigger. The largest live painting I have done so far was 48x72 inches for Mercedes Benz. In additon to your Principal Wedding Painting, I may be able to do smaller paintings as gifts - such as the Father Bride Dance. I may also paint be able to paint family portraits - while everyone is in town at the same time.